Cream together butter and sugar. Add eggs, vanilla and almond extract. In separate bowl combine flour, cocoa, ground almonds, baking powder and salt. Add to butter mixture. Batter will be a little sticky. dump onto a floured surface. Use floured hands to work with it. Divide into two balls. On parchment paper on a cookie sheet make 2 flat logs that are about 14" long by 4" wide. Bake at 350 for 35 min. Let cool 10 min. Slice into 1/2-3/4" wide biscotti. Lay all biscotti on one side and bake 10 min. 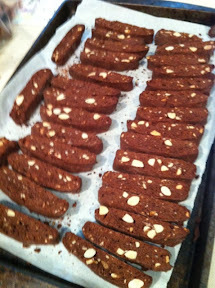 Turn all biscotti onto other side and bake 10 min. Thanks, Debby! This poor little blog has been quite neglected! Time to get moving again, right? Enjoy the biscotti - they are sooo easy to make!